Nuppeppō (ぬっぺっぽう)/Nuppefuhōfu (ぬっぺふほふ) is a huge flabby blob of [undead] flesh with the suggestion of a face in the folds of the fat. It reeks of body odor that stinks like rotting flesh. 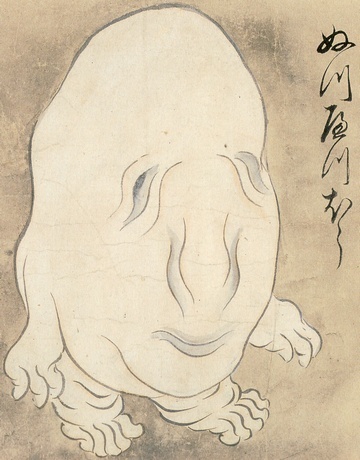 The Nuppeppō is typically encountered at night toward years-end, and around graveyards or abandoned temples, but other than to give those who meet it a fright, the Nuppeppō seems fairly innocuous. In fact, I'd think it would actively try to avoid people, since there is a legend that those who eat the flesh of the Nuppeppō can have eternal youth. 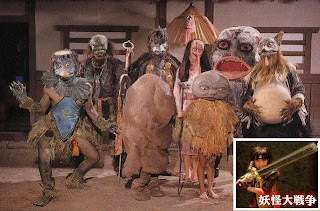 To make the creature a little more fearsome, I'd give it the powers of the Nuppefuhōfu from episode 32 of Ninja Sentai Kakuranger. It was known as the "face-stealer" in the Mighty Morphin Power Rangers show. 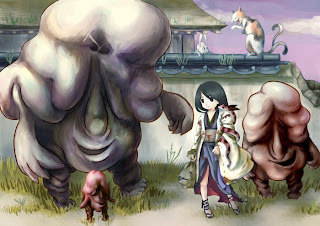 The Nuppefuhōfu appears on the 4th full moon of the year, and attacks people to rob them of their souls. It does this by using its tongue to lick the face right off of its victims, leaving them an empty, faceless husk. 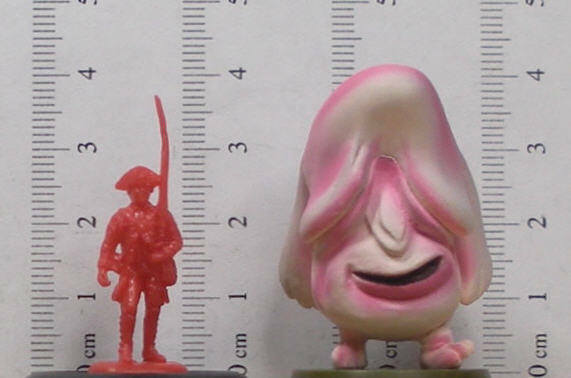 As far as miniatures go, there are a number of plastic and vinyl figures that have been made in Japan. The one I have is from the SAN-S Manga Heroes GeGeGe-no-Kitaro Mini Big Head Figure Collection. In this instance, the creature is known as Nuppehōfu (ぬっぺほふ). I bought this figure because I imagined that Nuppeppō would be huge compared to a human, but upon doing some on-line research, I found that the de facto height seems to be closer to 1.5m. 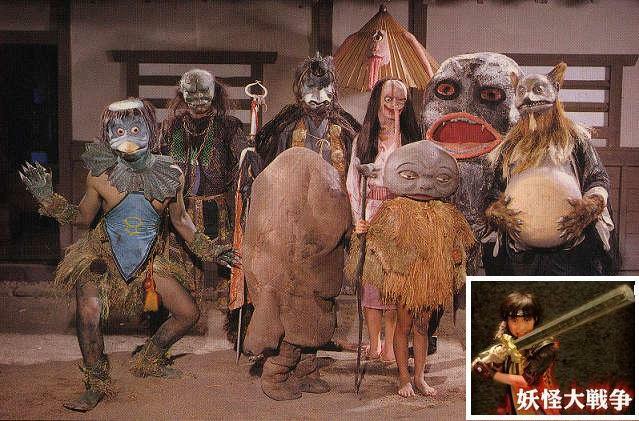 Screencap from the The Great Yokai War (妖怪大戦争). Nuppeppō is the short, blobby one looking in the wrong direction. The SAN-S figure scales out to roughly 8' 9" (2.7m) in height in 1/72 scale. Nevertheless, I will still use the figure as a giant Nuppeppō. 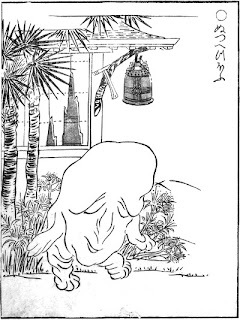 After all, since it is an imaginary creature, different takes on the size of Nuppeppō can exist. I will however, have to repaint the miniature, because the pink shading is just awful. Wow, I knew nothing about this. Thank you. Your miniature figure troubles me, though. 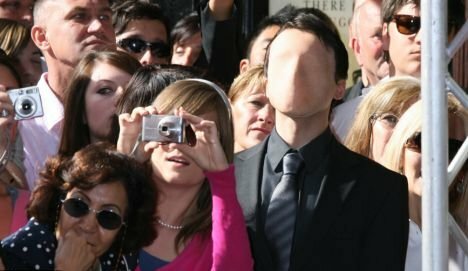 I hope I'm not the only person to see what I see in it. 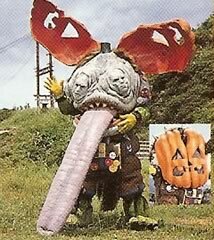 Nuppeppo is rather gross. I find it strange that some people actually consider it cute.